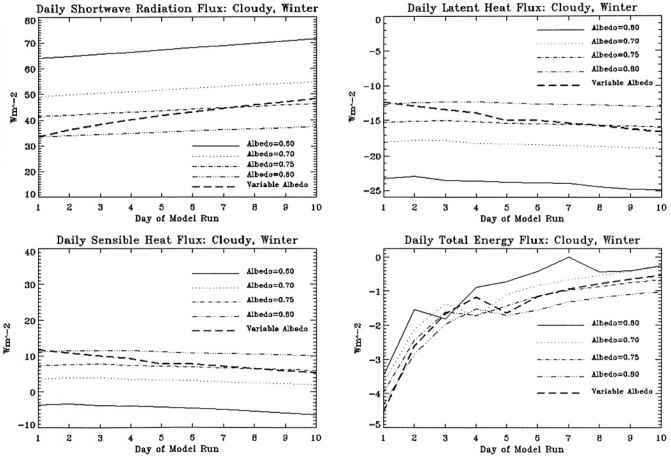 Fluxes for the winter/clear sky scenario are shown in Figure 3. Maximum shortwave fluxes correspond to the lowest albedo value (i.e. maximum solar absorption into the snowpack). The difference in shortwave absorption between albedo=0.6 and albedo=0.8 is »38 Wm"2. For the variable albedo case, albedo decreases from 0.83 to 0.73 over the course of the model run as a result of grain growth from a diameter of 360 fim to 900 jam. This alters the daily mean shortwave flux by as much as 12 Wm"2, the daily mean latent heat flux by 3 Wm"2, and the daily mean sensible heat flux by as much as 5 Wm"2. 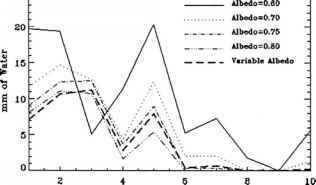 Positive and negative values in the different fluxes tend to compensate each other resulting in very small values for using any of the albedo parameterizations. 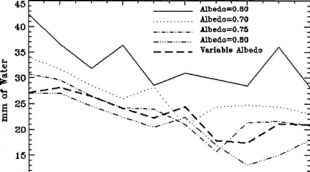 However the individual flux terms are estimated differently depending on the albedo parameterization. Under the winter/cloudy scenario (Figure 4), incoming shortwave radiation is lower than under clear skies. The sensible heat flux under cloudy conditions is also lower because the temperature gradient between snow and atmosphere is smaller. Also, under cloudy conditions, increased longwave fluxes (not shown) from the atmosphere decrease the cooling rate of the snowpack. As a result, AQ is negative and of even smaller magnitude (-5 < than during clear conditions. The effects of the albedo para-meterizations on energy fluxes are similar under cloudy and clear conditions. 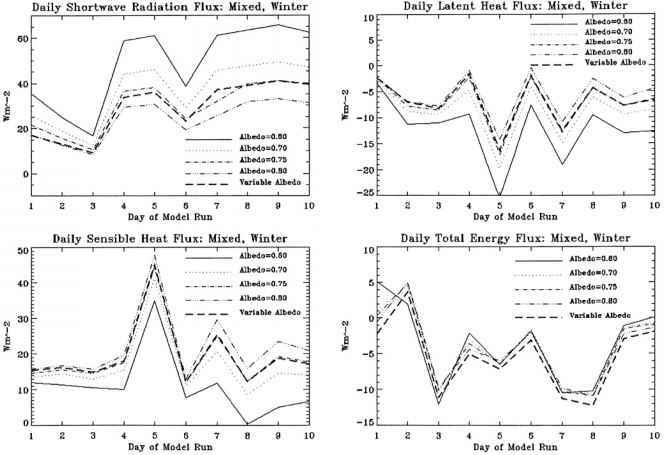 In the winter/mixed case (Figure 5) shortwave radiative effects are much larger for clear sky periods than for cloudy periods. On Day 5 when skies are clear and air temperatures slightly increase, the sensible heat flux increases strongly because of a larger temperature gradient between snow and the overlying atmosphere. Increased sublimation also occurs on Day 5 due to warmer air temperatures coupled with increased solar radiation. Under these winter conditions, the shortwave radiation and the turbulent fluxes are sensitive to the albedo parameterization. 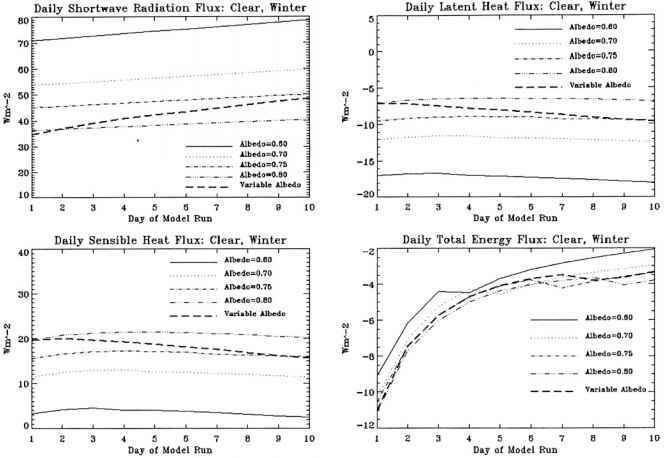 However, because solar insolation is relatively small during winter and turbulent fluxes tend to cancel each other out, in this case the total energy flux is relatively insensitive to albedo parameterization. During spring, warmer air temperatures and higher insolation lead to more significant effects in surface-atmospheric fluxes (Figure 6). The temperature gradient between the atmosphere and the snowpack is larger than during winter, thereby increasing the sensible heat flux. The latent heat flux is positive for Days 1-3 indicating that deposition is occurring on the snow surface. However, when clear skies return on Day 4, the latent heat flux again becomes negative implying that sublimation is dominating over condensation. While the latent and sensible fluxes tend to be higher than in the winter scenarios, they are relatively insensitive to the choice of albedo parameterization. 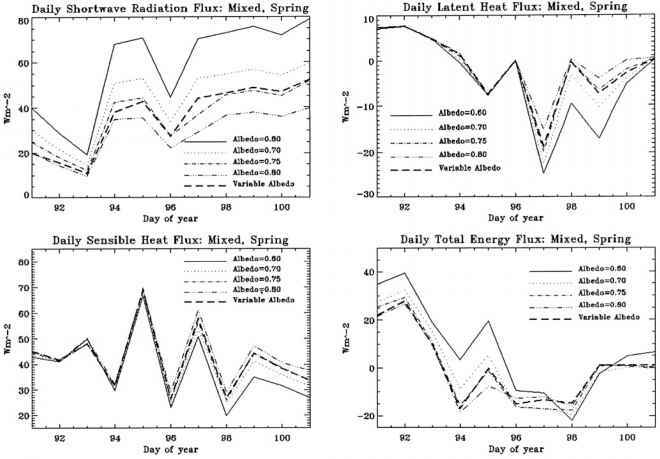 Shortwave radiation, which is most sensitive to albedo parameterization during clear periods with high insolation, controls the patterns seen in the mixed/spring plots. These relationships are similar to those observed and modeled by Marks (1989) in his investigation quantifying snow-atmosphere fluxes at sites in the Sierra Nevada, California. Meltwater generation is another reflection of changes in AQ. 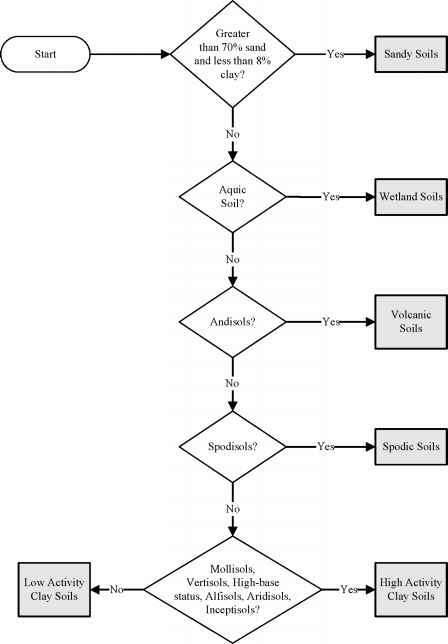 Spring meltwater production is plotted for the five different a parameterizations in Figure 7. In all scenarios, meltwater production for a =0.6 is far greater than for a =0.8 (in some cases is nearly double). Under both clear and cloudy conditions, the variable albedo case first tracks a =0.8 and then follows a =0.75. In the mixed/spring case, the largest differences between different parameterizations are evident during clear sky conditions. For a single day (Day 5), melt varies by as much as 15 mm, ranging from a minimum of 5 mm (a = 0.8) to a maximum of 20 mm (a = 0.6).